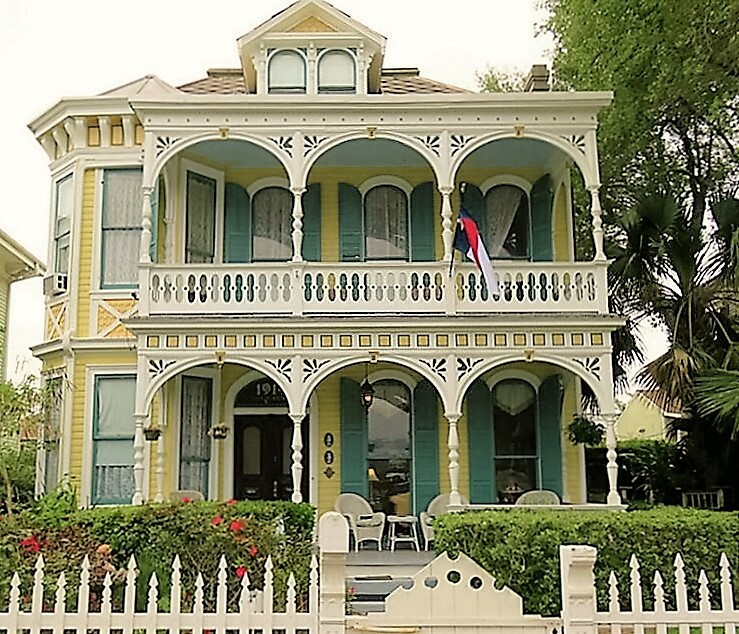 The above 1887 Queen Anne, Victorian, Galveston home, was built by Alfred Mueller. It's grand presence derives from stick work arches springing off carved posts, intricate balustrades, dentil molding, carved brackets and a topping belvedere. Its presence elegant, stately, nearly a wedding cake with each layer decorated. During the Victorian period a grand home boasted sweeping stairwells, punctuated by carved newel post, topped with glass ornaments, candelabras, and occasionally a gas light. 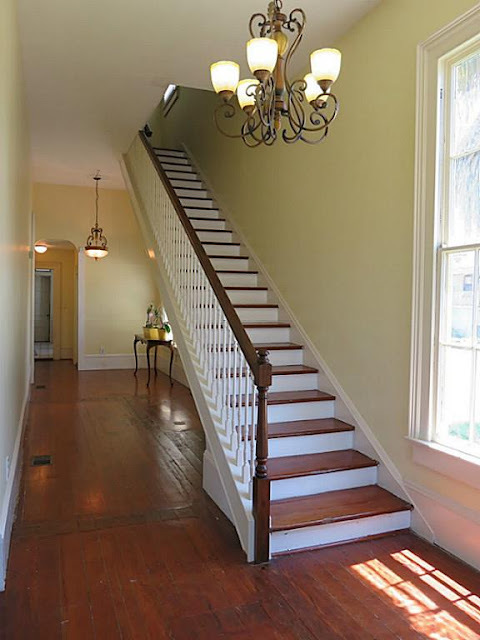 This Queen Ann doesn't disappoint; her sweeping stairwell features a carved balustrade, and burlwood newel posts, topped by an electric wired, antique gas newel post light. An archway sitting atop intricately carved brackets, frames the view to stunning stained glass windows. Brightly colored glass punctuates the space with the vibrant colors Victorians are known for. Paneled double doors featuring etched windows, are crowned with an arch window above. An original oil lamp chandelier has been updated with electricity, and hangs overhead like a bright jewel, its rich red color repeated from the stained glass windows. Carved pilasters topped with rosettes, line the entrance from the foyer to the parlor. Grand and elegant, this foyer exudes Victorian brilliance. 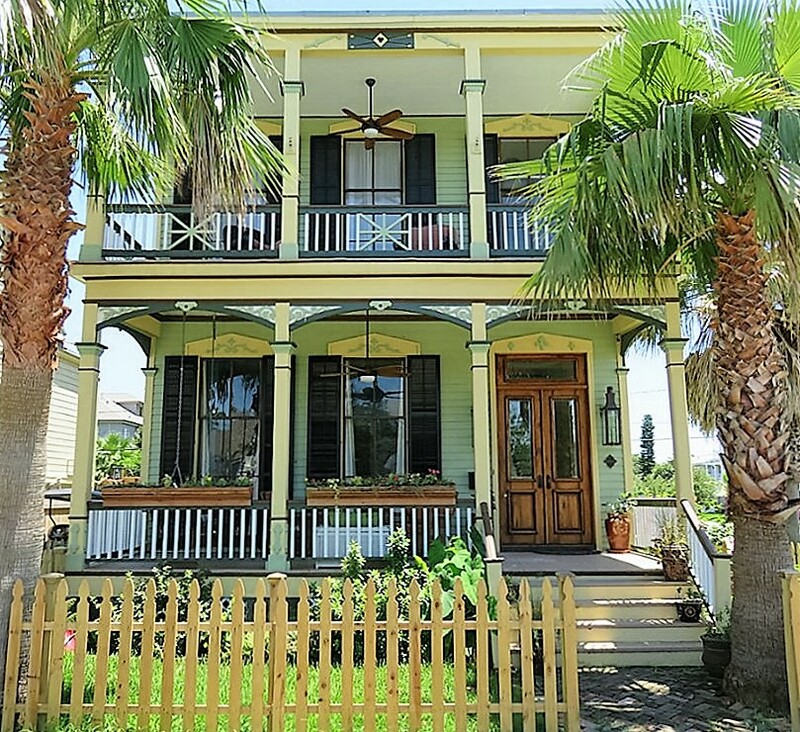 This Victorian island home is a bit more modest. 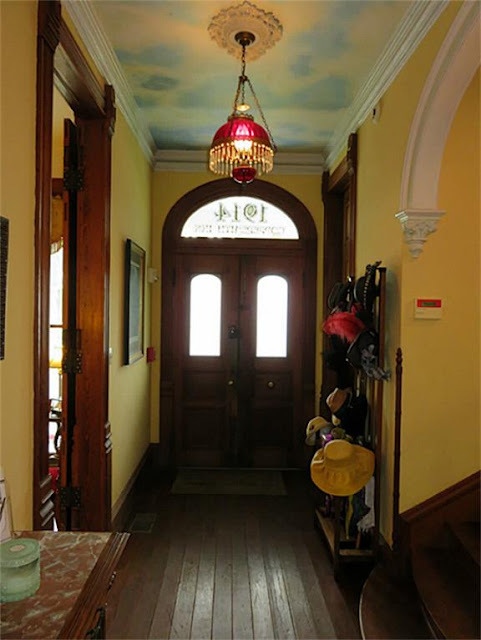 Built in 1878 in the Second Empire style with pediments topping windows, and paneled double doors that lead to the foyer. The columns and balustrade are understated with square corners and simple Doric caps. Again, arches spring up from her columns giving a bit of grace to her otherwise linear façade. 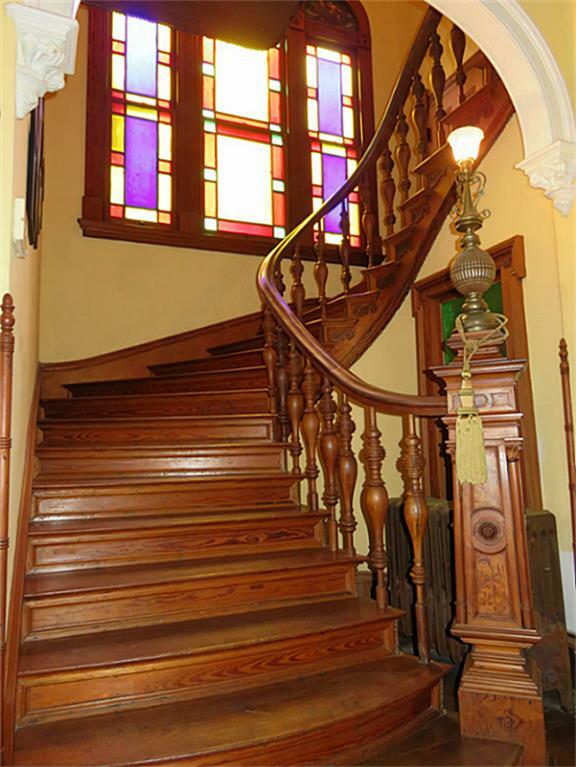 A more modest two story Victorian foyer featured; a straight stairwell leading up to the private second floor, again accented with a carved newel post and balustrade. This Empire styled Victorian doesn't disappoint; turned spindles and newel posts create an understated elegance to this foyer. A tall, narrow window situated next to the stair baths the foyer in light. Originally, a brass chandelier would have graced the foyer. Notice how soft the rise is up the stairs, ladies could certainly make a graceful entrance. The two Victorian homes featured above are actually available for sale. If you are interested in more information, please contact the listing agent; Tom Schwenk by visiting his website here. Through the years our cottage has enjoyed many curators, each leaving their personal mark upon her. At times it is difficult to decipher original details from bits of past curators. We believe, the cottage had an "L" shape porch that graced a portion of the façade, then turned backward at the corner where our current front door is located, the porch travelled backward along the left side. We also guess that the corner of our cottage was actually angled. The left side of our cottage shows the original foundation marked with archways. The porch, we believe, rested upon that foundation. From the original foundation, footprint, is a suspended bump out. The bump out measures seven feet wide by twelve feet long. 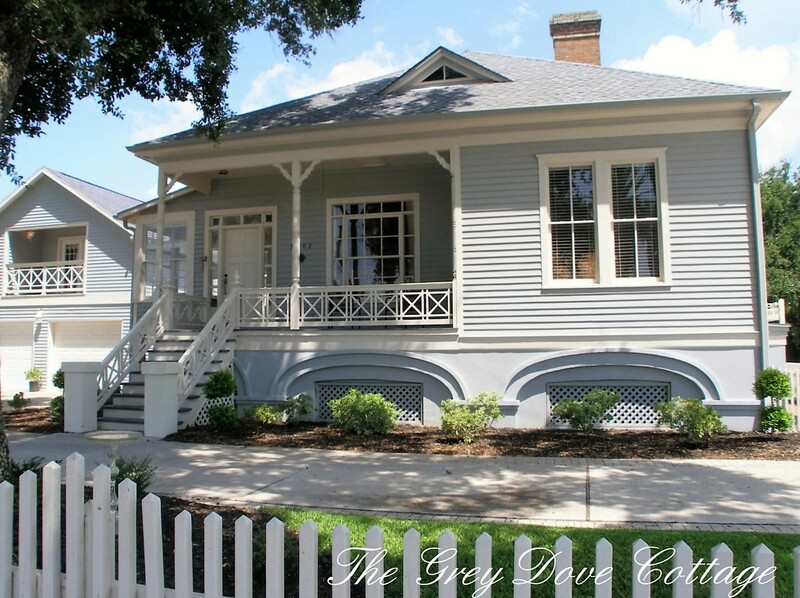 We believe the bump out may have occurred during the 1940's, due to the large French paned windows with wavy glass. Does that shuttered doorway or window seem familiar? Allow me to introduce Margaret Edythe Bettencourt, and her baby daughter Laureene. 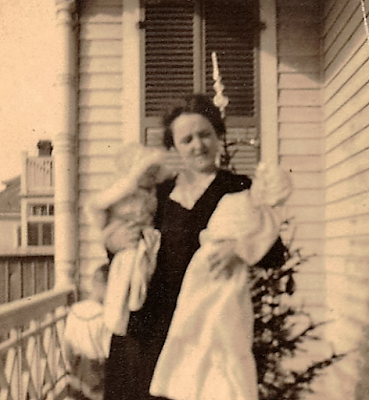 Standing in front of the doorframe or window above, Christmas 1916. This discovered photo, provides confirmation of our guesswork; the original porch was an "L". We remain uncertain if there was a window or a doorway at the end of the "L" shaped porch. 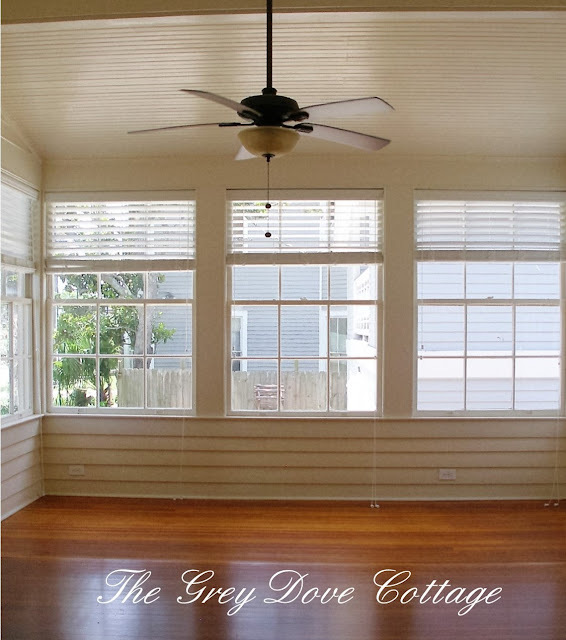 In this interior photo you can see the floor is raised in an effort to cover the original porch surface, and extend over the bump out. The bump out creates the foyer. The room is bright, lined with French windows. The ceiling over the bump out angles downward from a rafter. The rafter indicates where the porch ceiling originally stopped. The space lacks Victorian charm; slender windows, pilasters adorned with rosettes, stained glass, all missing. Having a space, and a home with a bit of an identity crisis, introduces design dilemmas. The task of creating an interesting, warm and inviting home, while being respectful of historic details can become a bit daunting. It is important to remember that though not original, the bump out is part of our cottage heritage, her history. We chose to remove the shelves and the framework added to the bottom of the doorway/window, leaving the outside frame. 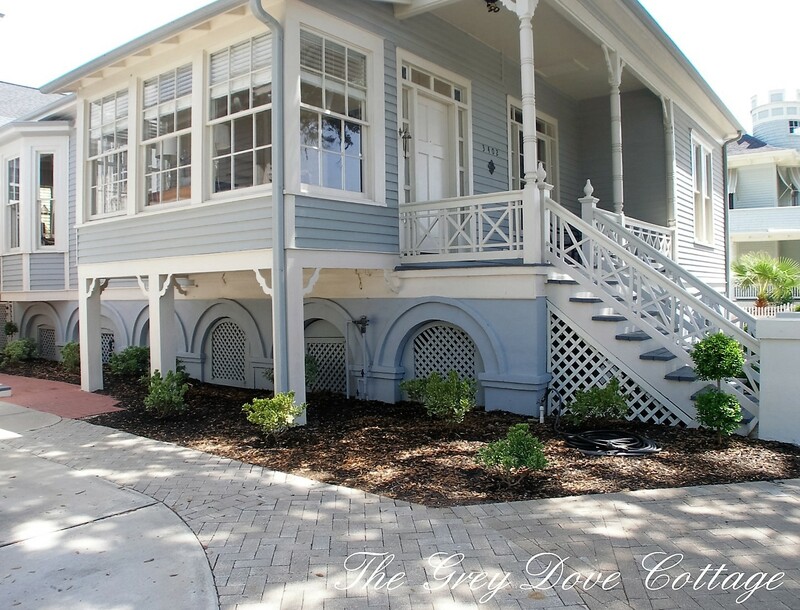 Our choice was in an effort to preserve a bit of her original architecture. In doing so, we discovered that the "wall" across the doorframe, is actually the backside of the sheetrock in the keeping room! 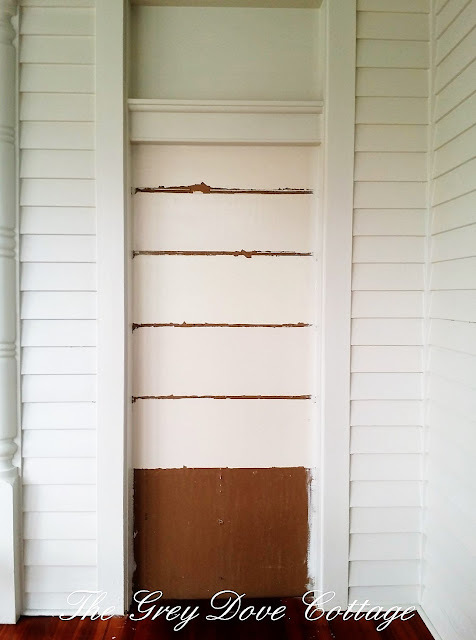 The door previously passed from the foyer to keeping room, contractors merely covered it over using a single sheet of drywall. This discovery offers a challenge, nothing can be nailed to the wall, it would punch through to the keeping room. Thinking every foyer needs a table for keys etc... 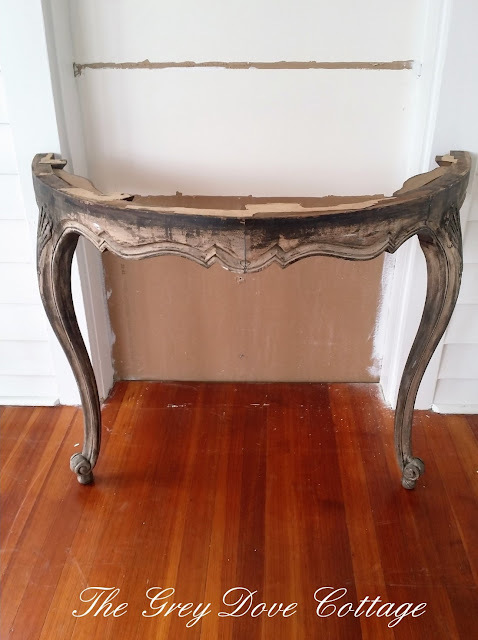 I went in search of a console table that would fit the door width. Fate stepped in. While a friend, Carol and I were wandering about in a local antique warehouse, we happened upon a portion of a dining table, two legs and an apron. A quick measure determined it was the perfect width to fit the doorframe. Carol, sprang into action negotiating a fare price for the remnant, and we wandered home with our treasure. I attempted to patch and paint the damage back wall. 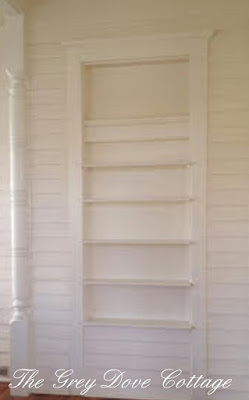 The remnants from the shelves remained, lines and imperfections showed through the paint. I considered wallpaper. Then rummaging through a cabinet I happened upon several French books we purchased years before while in Round Top. 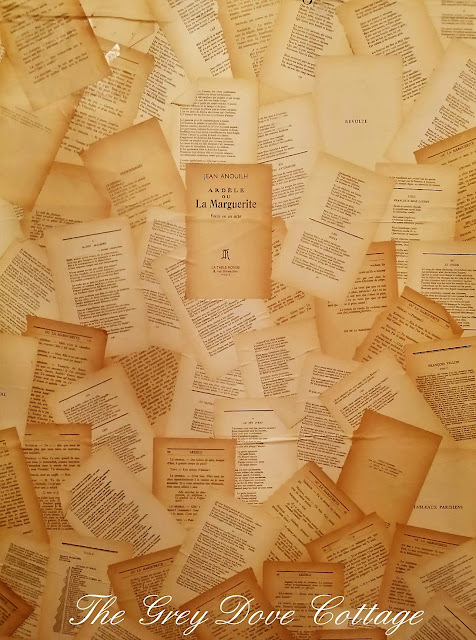 I wondered how the pages of the books would look, papered upon the bare sheetrock. 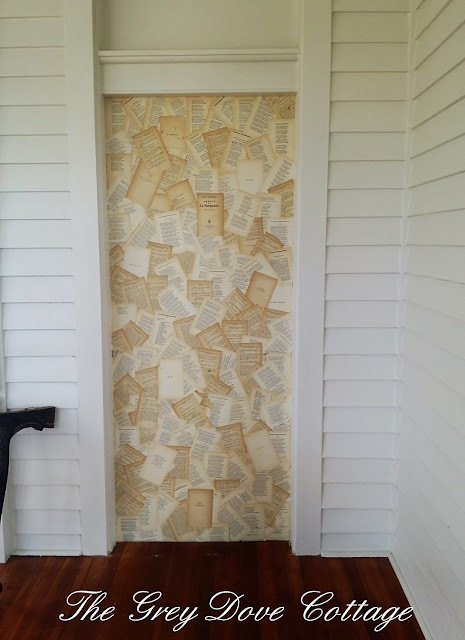 I gave it a go - carelessly papering the pages as though they had blown onto the wall, no pattern, no uniformity. The antique book pages, added texture and interest to the space. The doorway is directly across from our front door. I wanted to create a focal point ,while being respectful of what we feel is and original door or window frame to our cottage. 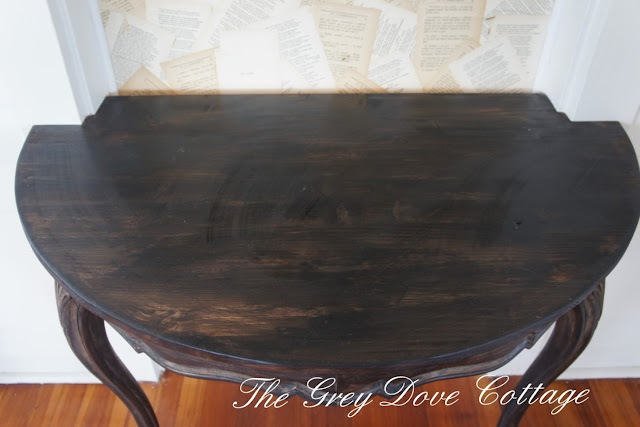 Feeling the console needed more presence, I gave it a bit of black wash using chalk paint. Mr. GDC, affixed the table remnant to the doorframe. He then cut a table top, taking care to notch the back edges of the top, fitting it snuggly inside the frame. We decided, reaching outside "the box" rather than have a table for catching keys and mail, we would create a wine bar. 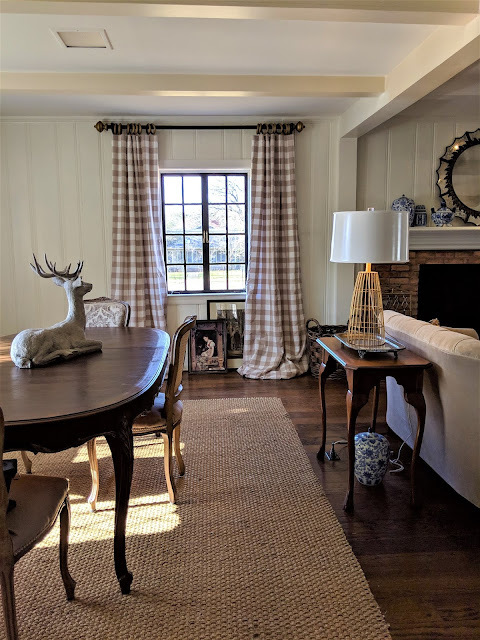 Rather than having a foyer that you passed through, we would create a sitting area for friends who call, a place to visit, enjoy a glass of wine, and lively conversation. 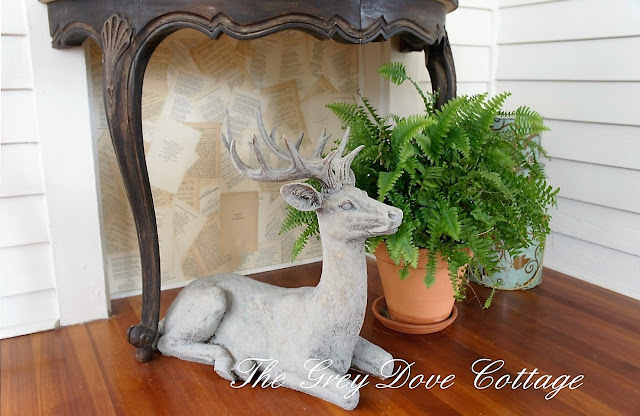 The base of the table is dressed with a stag sitting guard alongside a Boston fern, hinting to the Victorian era. 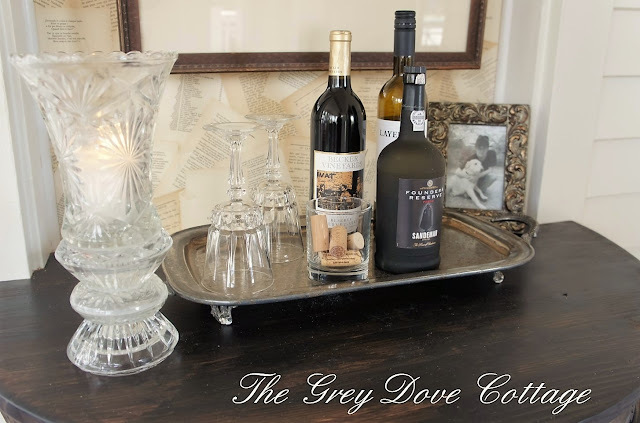 An antique silver plate footed tray serves as the setting for wine and stemware. 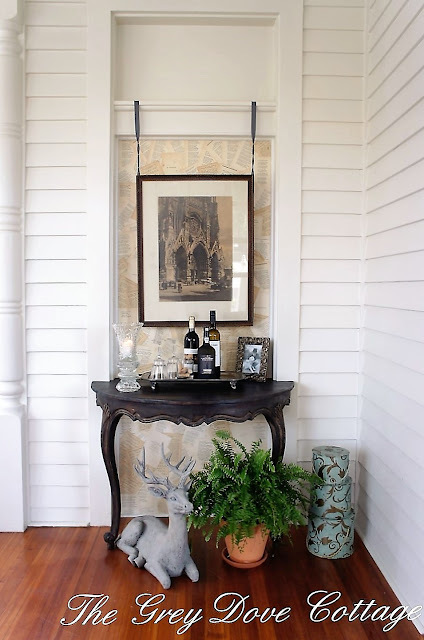 The view as you enter the foyer; shows the original door or window frame, dressed as a wine bar. We know the doorway dates at least to the period of the bump out. I am considering making a faux transom window to install at the top, finishing off the space as a doorway. Another option would be to remove the cross bar and paper the pages upward to the top. I am also rethinking the art, considering a bit of modern black and white, rather than Notre Dam. 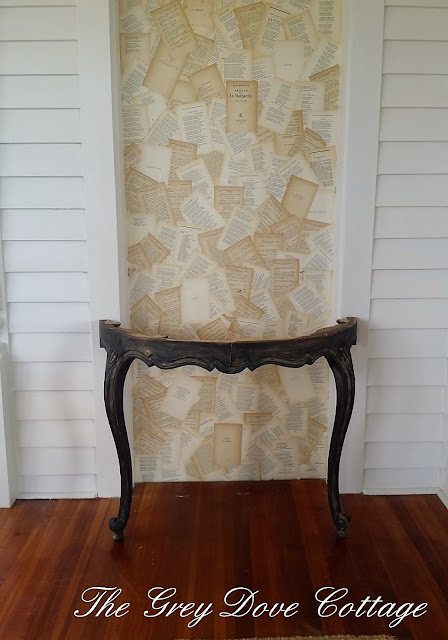 A little edge might be nice in front of the antique French book pages. One thing you can count upon, things will change. I'm sewing drapes, searching for a rug, and moving furniture about. I'll be back soon with a "finished" foyer (not that anything is ever finished). Thank you! It was a quandary; so many pieces of the pasts in one small space. I appreciate the compliment. I continue tweak. 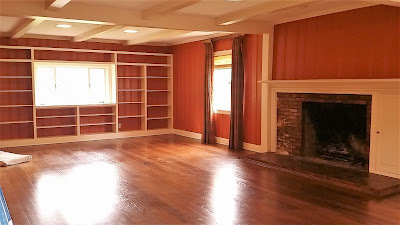 Those like us, are we ever "finished" with a room?